We are on the verge of being barbecued out. So far we have dipped a toe into the vast pool that is saucy St. Louis barbecue (the kind we get back in Bangkok), worked our stomachs through the tomato-based charms of Kansas City barbecue, and taste-tested our way through the dry-rubs and spice mixes of slathered on Tennessee pork. We’ve even given in to the South’s implicit encouragement to let loose our inner Lindsay Lohans and indulged in a tipple or two, getting gently soused at the Grand Ole Opry and absolutely plastered at an Alamo Drafthouse showing of “Guardians of the Galaxy”. We have been as thorough in our “research” of the region’s meat and mead as our digestive systems could possibly allow. But it’s the “white barbecue” of northern Alabama that I’m curious about the most. Unlike the red, sweet and frankly ketchup-y sauces of the American Midwest, white barbecue sauce is based on mayonnaise, tarted up with cider vinegar and pepper for a bit of kick. Because it’s mayonnaise-based, this sauce is either applied at the very end of the cooking process, or served on the side like, well, mayonnaise. It’s something most Asians — and, I’m willing to bet, Northerners — don’t know much about, and it’s served in the tiny patch of land between the northern Alabama border and Birmingham. There was no way we could miss this. Big Bob has several locations, including a brave outpost in the rival BBQ land of North Carolina. The one we head to is just off of Highway 31, and like every BBQ place we’ve been to before us, it is packed. This is also a proper restaurant, with the feel of a BBQ-based Denny’s. Recommended: the ribs and brisket, and we get a bit of pulled pork to go with it. Of course, Karen also wants the cole slaw, since she appears to be intent on taste-testing every slaw that crosses her path on this trip. And there are the beans, which seem to be properly cooked instead of the doctored beans-in-a-can that have been one of the mainstays of our diet for the past two weeks. Most importantly: set on every tabletop in the place is a big bottle of Big Bob’s white barbecue sauce, as well as their more traditional “award-winning” tomato-based sauce. Verdict: For the first time, the ribs feature meat that sloughs off the bone. How wonderful to see gravity work on something that doesn’t involve a part of our bodies. Portions are substantial, the slaw is chopped finely and simply dressed (we have been at this enough to develop a preference for this kind of slaw), and the beans are oomphy and well-seasoned. BUT THAT SAUCE. That white sauce — a mix of the sweetish, faintly chemical taste of commercially-made mayo married to the burning-rubber acerbic tang of vinegar — was almost orc-like in the majesty of its sheer awfulness. So I guess I’m not a fan. In fact, traumatized by our encounter with white barbecue sauce, we have beer for dinner in Birmingham. You might already know how I feel about fried chicken. And waffles are okay too. So when our friend Dwight Turner of bkkfatty.com recommended this chicken and waffle place, we made sure to include it in our itinerary. In fact, it might be the biggest reason why we are in Atlanta. There are two kinds of chicken and waffles. One is the Amish version, which involves piling shredded, stewed chicken meat on top of a waffle and covering the lot in gravy. You don’t see too much of that in restaurants, probably because it sounds a little gross. 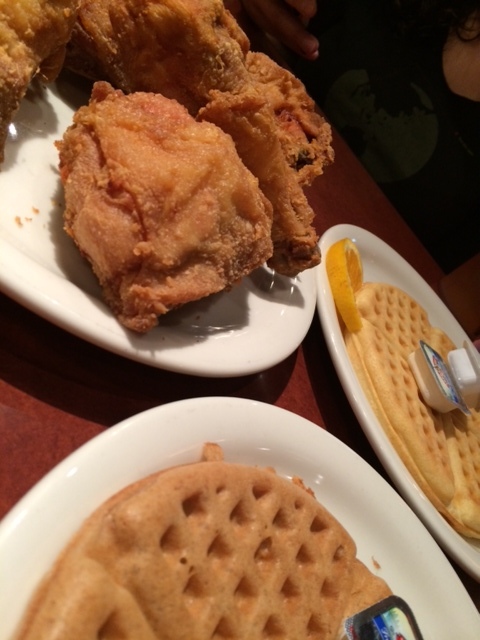 The second is the kind that we are all familiar with: fried chicken set alongside a waffle with butter and syrup. In other words: dinner and breakfast, all on one plate. The most common myth on the origins of this dish rely on its dual nature: when jazz musicians in Harlem in the 1930s finished their gigs in the wee hours of the morning, they couldn’t decide between breakfast and dinner, so combined the two. And voila, chicken and waffles was born. Gladys Knight (yes, THAT Gladys Knight) offers a dish fittingly called the “Midnight Train” (an original waffle with four fried chicken wings), but we wanted leg, thigh and breast meat instead. We also wanted to try their other waffles (we tried both apple-cinnamon and pecan, along with original because of course). The combination of crunchy hot fried chicken with sweet, buttery waffle is just as you would expect it to be. In a word: DELICIOUS. But that was before we got to Page’s Okra Grill. Now, we have had almost uniformly great experiences at all the places we’ve been to on our trip, ranging from pleasant to heartwarmingly friendly. Okra Grill actually goes beyond this to such a degree that Karen actually became a little suspicious, hypothesizing that maybe they were fattening us up to serve us later for dinner. Don’t worry, they don’t really do that. We are still alive, you guys. I know you were worried. It’s just that these people are so “OMG! BFF” nice. 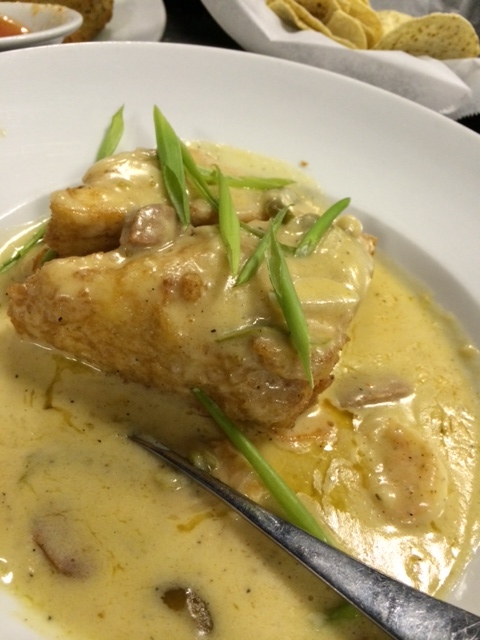 There is a lot to choose from here, but the menu item that Okra Grill is most proud of is the shrimp and grits. Unlike the usual congee-like soup topped with a few grilled shrimp, the grits here are “lightly fried” into a cake, topping a creamy “stew” studded with cooked shrimp. It’s good, and so so fatty. I can still taste it three days later. Once they found out about our barbecue tour, they made sure to give us a little sample of their pulled pork and mustardy BBQ sauce. And you know, it’s … just like sweet mustard. Mystery solved! 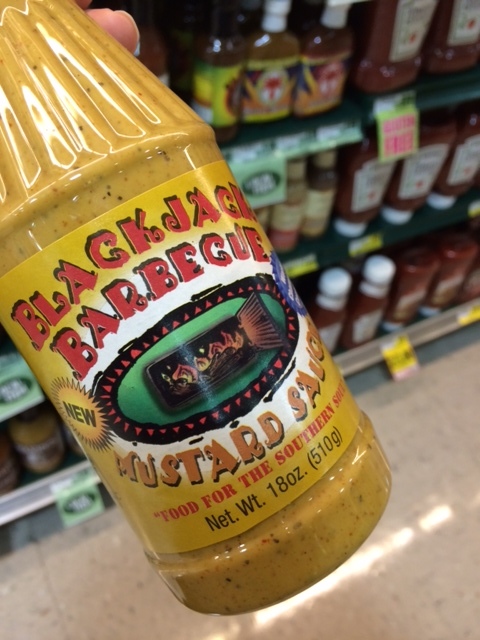 Mustard-based BBQ sauce tastes like mustard. Go figure. 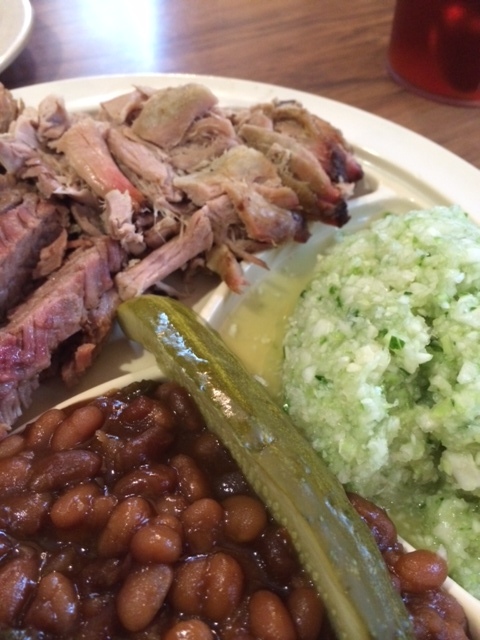 Next up: North Carolina, what many consider the mecca of American barbecue. We are on the tail end of our trip! It’s hard to believe. Exercise in futile attempt to stave off said pounds: One 60-minute run in Alabama, a 45-minute run in Atlanta, a half-assed 40-minute run in Charleston. amazing … we are already planning our trip in your footsteps! Make sure to have lots if room in your stomach!